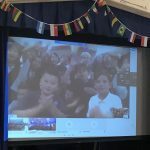 Connected via live video links, Yew Chung and Yew Wah international schools worldwide celebrated Founder’s Day as one big family! Due to the time difference between the United States and China, YCIS Silicon Valley families gathered for a pizza dinner party prior to joining the live celebration at 7pm on October 11. Silicon Valley fifth graders Duke T. and Aiden H. along with fellow students sent greetings to our friends abroad. 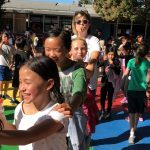 Everyone was especially excited to look for our middle schoolers who were celebrating Founder’s Day at a Yew Wah school in Tongxiang as part of an exchange visit. Each year, Yew Chung and Yew Wah celebrate Founder’s Day to commemorate Madame Tsang’s achievements and the history of our schools. Founder’s Day 2018 celebrates 86 years of Yew Chung. 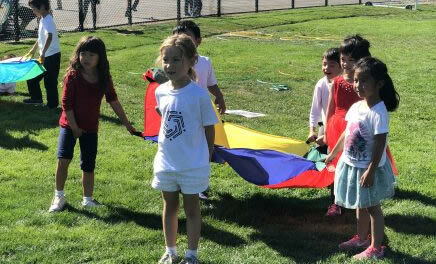 Each school celebrated with fun activities including sports and games. 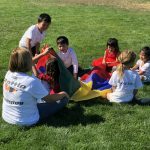 At YCIS Silicon Valley, preschoolers enjoyed birthday parties for YCIS while K-8 students took advantage of the wonderful California weather with field day games.